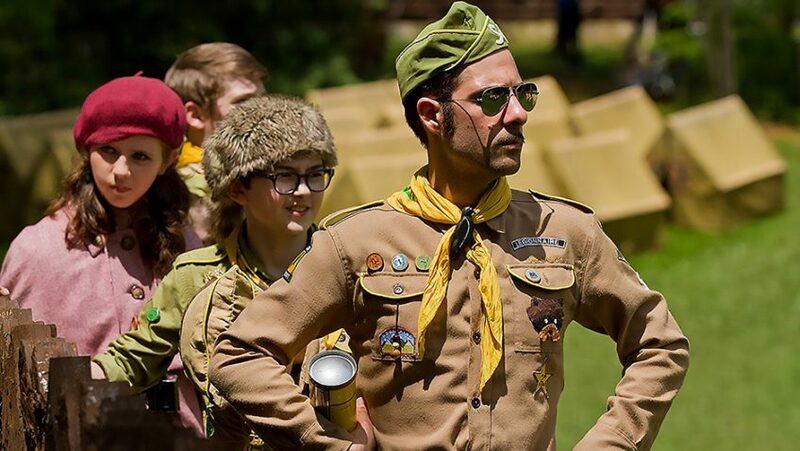 Joyce Glasser reviews Moonrise Kingdom (May 25, 2012) Cert. 12, 92 min. Many films segregate the old and the young, or, when generations intermingle, pit them against one another. In many cases older men hanging around younger boys or girls points to something sinister and unhealthy. 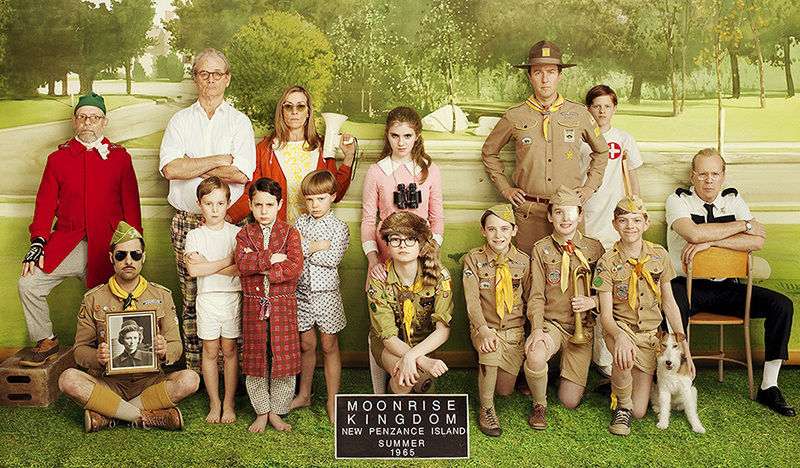 It’s therefore refreshing to experience Wes Anderson’s new film, Moonrise Kingdom , in which a 43-year old Scout Master (Edward Norton) and a 57-year-old local cop (Bruce Willis) risk their jobs to help a pair of 12-year-old runaways who are in love. With his distinctive style, Wes Anderson divides opinion like few other directors. 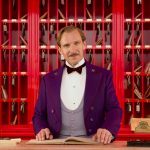 He was nominated for an Academy Award for The Royal Tenenbaums, but even fans had reservations about The Life Aquatic with Steve Zissou and Fantastic Mr. Fox. Anderson’s films are nothing short of whimsical and he thrives on oddball characters, dead-pan humour and elaborate, primary-coloured sets that sometimes overwhelm the thin, or impossibly complex, story lines. 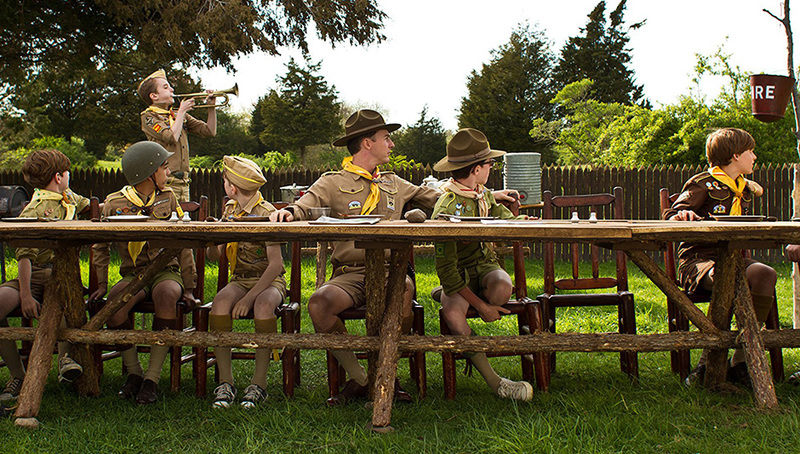 Moonrise Kingdom might well prove his most divisive film, but it’s his most charming and, arguably, his best. The story takes place on a remote island somewhere in New England (the film was shot on Prudence Island, Narragansett Bay, Rhode Island) in 1965 when children could still be innocent and Boy Scout camps dominated the summer landscape. Pristine woods, a dramatic coastline with calm inlets for bathing, and torrential rain storms provide the summer playground for growing up on your own terms. 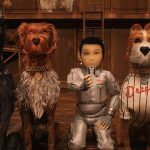 In this film, it’s not only the children who grow up. Two twelve-year-olds, troubled, solitary, book-worm Suzy Bishop (Kara Hayward) and orphan Sam (Jared Gilman), a nerdy, bullied Boy Scout, meet by chance; take an instant liking to one another; and don’t want to be apart. Sam’s latest foster family have entrusted him to the care of local Scout Master Ward (Edward Norton) for the summer, while Suzy is living in Americana splendour in a sprawling, wooden New England home, along with her three young brothers and their much older parents (Frances McDormand and Anderson regular, Bill Murray). Through her window, the observant Suzy sees her mother in an intimate conversation with Sheriff Sharp (Bruce Willis), a conversation that we, the audience, can both see and hear. Suzy’s mother is breaking off her affair with a distraught Sharp. When Suzy and Sam run away together into the island’s forests (with the aim of following an historic trail), the sleepy island community turns manic. The adults, and Sam’s fellow Boy Scouts who are despatched in pursuit of the charmed couple, are changed forever by the experience. Moonrise Kingdom is so removed from what we are used to seeing at the cinema today, that it’s not only genuinely funny but disarming. Nothing is predictable (to be fair, Anderson is never predictable); but neither does anything seem random or self-indulgent, which is where Anderson’s films sometimes fail to engage the viewer. The quirkiness is balanced in part by the casting, with Murray playing a minor role. The great actor, Edward Norton (25th Hour, Fight Club, American History X) who in his khaki shorts, slicked back hair and mannered demeanour displays his seldom seen comic bent, is a more complex man underneath his Scout Master/maths teacher façade. Complementing him, the brilliant child actors convey characters who are so genuine, caring, grounded and competent – Sam’s mastery of camping is second to none – that they impress us, and their elders. Still in the film’s most touching moment, we hear Sam, upbeat, saying that he is feeling more like a part of his foster family, ignorant of the fact that his foster family are in the process of dropping him. And then there’s Bruce Willis, who we never thought we’d see in a Wes Anderson film. As the lonely, island Sheriff, Willis is playing a variation of his many cop/agent/special ops/gumshoe screen personas, but his heroism is much more subdued. A marginalised man who has lost any ambition he had, he now lives alone in a caravan. Childless, yet with a paternal instinct that emerges throughout the film, he is troubled by hearing Sam’s foster father report that they ‘can’t invite him [Sam] back’ because the boy is so much trouble. The Shriff is in love with a married woman (McDormand) who can’t leave her husband (Murray) because of their children, and finds himself sublimating his frustration by helping young Sam to achieve the fulfilment that he himself is denied. It’s a deep, convincing and moving motivation. And in that respect, audiences will note the touching irony of the film’s conclusion. It’s apparent that it isn’t the young lovers who need saving half as urgently as the adults. In a delightful concession to quirkiness, the film is punctuated by a recording of Benjamin Britten’s 1946, The Young Person’s Guide to the Orchestra that is always being played in Suzy’s house. Composed to accompany an educational film about instruments in an orchestra, the structure of the film seems to follow Britten’s orchestral composition, as narrated in the recording.